Produced by ISIS media, the Arabic reads “Firing the TOW missile system against the apostates.” The set of photos released together, which can be viewed here, claims Al-Qarytayn in the countryside southeast of Homs as the location. ISIS fighters are currently boasting of the deployment of their latest military hardware through photos distributed by Islamic State’s “Wilayat Damascus” (State of Damascus): the US-supplied BGM 71E TOW anti-tank missile system. Among those confirming the authenticity of the photos include analysts at the hawkish Brookings Institution and the Foundation for Defense of Democracies funded Long War Journal. 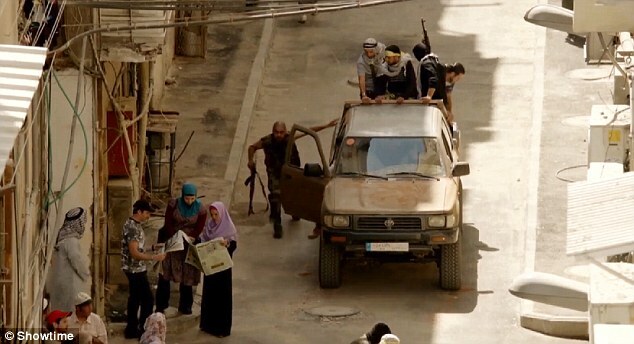 In the photo set, many Islamic State fighters can be seen amassing in more than 15 technicals, or armed pickup trucks. The pictures then show the use of the TOW missile on Free Syrian Army (FSA) units. The last few photos show FSA members the Islamic State has taken captive. It is more likely the US provided the rebels with the TOW missiles whilst knowing it would end up in the hands of Al Qaeda. Indeed it has been widely accepted, that Jabhat Al Nusra, ISIS and Ahrar al Sham, another Al Qaeda linked group, are the most powerful groups opposing the Syrian army. Indeed, it has been documented by an external monitoring group, the UK-based Conflict Armament Research, that the well-known CIA-Saudi program (publicly acknowledged to have begun in 2012) to transfer thousands of tons of weaponry to insurgents in Syria resulted in the arming of ISIS fighters. M79 90 MM anti-tank rockets captured from IS forces in Syria are identical to M79 rockets transferred by Saudi Arabia to forces operationg under the ‘Free Syrian Army’ umbrella in 2013. Expect more of US-made BGM 71E TOW systems to show up in ISIS hands. Eventually, enough photographic and serial inscription evidence will be available to establish direct chain of custody and origin. Expect the CIA, Pentagon, and their partners in the Gulf to be in full denial and defensive mode. A nice infographic from McClatchy DC. Some analysts have asserted that ISIS had no comprehensive plan, but merely desired to sow death and destruction in Syria. For this reason, Western countries, as well as Saudi Arabia, Qatar, and NATO member Turkey, did not make too much of a fuss about ISIS. More shocking is that there is growing evidence that ISIS directly benefited from Western-Gulf aid to the Syrian rebels. Looking at the below map of recently acquired ISIS territory, it looks like they have a very clear plan for long-term financing. It is well-known that NATO member Turkey has long kept an open border policy for Islamist insurgents, including Nusra Front and other Al-Qaeda aligned groups, to freely access Northern Syria. The above image is currently being circulated among international Syria analysts. It purports to show ISIS commander Mazen Ebu Muhammed being treated in a hospital in Antakya, Turkey (Antioch) on April 16, 2014. This raises some serious questions about whether ISIS has outside state sponsorship. Cui bono? ISIS has been the fiercest enemy of the Kurdish groups in Eastern Syria. The Syrian government has been content to leave the Kurds alone, seeing in them an ally against extremism. Christian militias have also linked up with the Kurds for the sake of mutual survival. This explains Turkey’s willingness to tolerate and help groups like ISIS, Nusra, and Islamic Front. Turkey has been using extremists to cleanse the borderlands of hated Kurds, Armenians, and Syriacs -leftovers from genocides of 1915 and 1990’s. Saudi Arabia gains by having ISIS tear through Iraq. The Saudis are deeply resentful of Iraq’s pro-Shia, Iran aligned government. For Saudi Arabia, the consequences of the American led regime change in Iraq were disastrous, as it opened a corridor of Shia hegemony straight from Iran to the Mediterranean (Iran-Iraq-Syria-Hezbollah). The Maliki dictatorship has been oppressive and intolerable for Iraq’s sizeable Sunni minority, hence the reports of Iraqi Army conscripts abandoning their weapons and uniforms as ISIS approached Mosul this past weekend. All external actors of the Gulf-NATO-Israel alliance have been quite OK with ISIS and other extremists operating in Syria. Collectively the Syrian insurgency can be likened to a pit bull: train a dog up to kill and then let it off the leash… but there’s no telling if it’ll come back to bite you. Various states have unleashed their pit bulls on Syria for various motives -it’s primarily the Western powers that have underestimated the extent of the mess. This week and next, American politicians and media pundits will be expressing their outrage that Bin Ladenite radicals have taken over much of Iraq. Yet these same voices have been cheerleading for the Syrian rebels over the past three years. 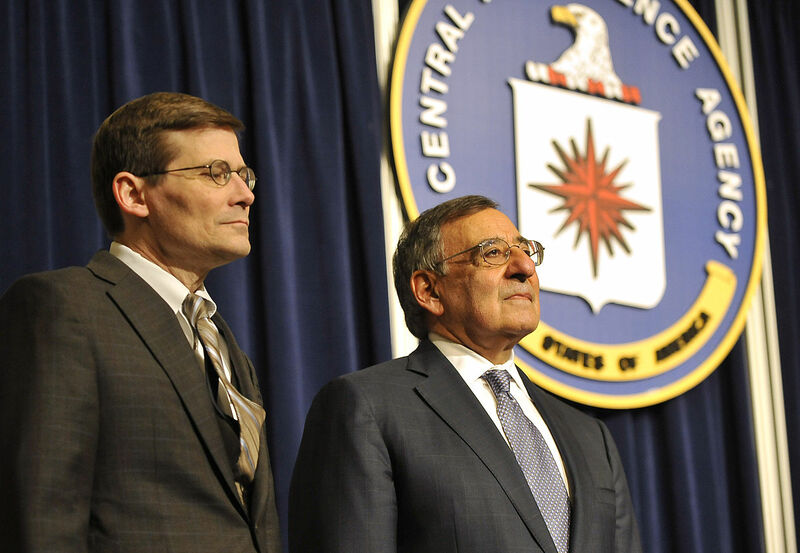 The CIA and Saudi death squads have gotten loose, and it hasn’t been the first time in recent history. But the constant and consistent failure of US foreign policy isn’t the real story here. The real story is the immense and unimaginable sufferings of common Iraqi and Syrian people as their states are destabilized through never-ending interventionism. As the civil war rages around them, Syrians in the capital of Damascus continue to support President Bashar Assad despite their fears. They simply want to maintain their way of life. During dinners with politicians and professors, or in conversations in the narrow streets of the old city, everyone, without exception, expressed fear of the rebels. They worry that the rebels will be accompanied by fundamentalists, who will bring with them Sharia law. All the people we spoke with said that they distrust the West because the reasoning there is too simplistic and countries there set moral standards they fail to live up to themselves. And most said that while they don’t support Assad, they want to preserve their way of life. “Just look at what’s happening in Egypt and Libya,” said one man. The Syrians described in the article recognize what most American media and political elites do not: it is dangerous to view the Middle East in mere blacks and whites. “Simplistic reasoning” leads to simplistic solutions. For the U.S. and NATO, there is one particular glaring demonstration of this still unfolding, and that is Libya. 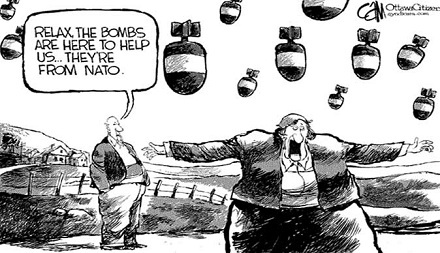 Syrians are all too aware of what NATO’s latest model intervention has wrought. Ironically, Libyan fighters represent one the largest contingency of foreign jihadists regularly flowing through Syria. The Der Spiegal journalists express genuine shock at the vibrancy of the city after over a couple years of brutal conflict, and the desire of Damascenes to want to preserve their way of life. After we finally reached Damascus, spending a few days there are enough to alter our image of the country’s civil war, because people there see it differently than we do in the West. They want to preserve what they have. The above lines are heartfelt, but there’s a pathetic aspect to the recognition: after two plus years of Der Spiegal coverage of the Syrian conflict, these seasoned journalists are just now getting it. For average Syrians, fear of government collapse is not merely rooted in a desire to “preserve what they have” – but in the awareness that government collapse means the total fragmentation of the last vestiges of civil secular order in Syria, and the imposition of Taliban style rule. The above photo, though widely circulated in media in other parts of the world, is one that not many Americans have seen. It is solely the work of the rebels in conjunction with NATO, who exacted revenge on Gaddafi’s favored city, by cleansing it of all inhabitants, and utterly destroying the city’s infrastructure. These are the bitter fruits of the “Arab Spring” – no wonder Damascenes are not so enthusiastic. Also not shown on the major American networks, were images of Libyan society prior to the NATO intervention. We were told that the U.S. must intervene for the salvation and betterment of the Libyan people, yet few in the West understood Libya and her difficult history – and certainly not the forces that would be unleashed should the state system collapse. We must bomb the country in order to save it. This, the same logic used at the beginning of September this year in the case of Syria. Like with Syria now, media coverage of Libya almost exclusively focused on the plight of the rebel side. Only this side of the conflict was allowed to be humanized. Americans really had no idea of what Libyan cities even looked like – the very cities which were to be on the receiving end of Western bombing raids. Western media and government disinformation campaigns are made easier so long as the general population is kept in ignorance of the realities of Middle East societies. When the time comes for government and media to make the case for “humanitarian war” (as interventions going back to Kosovo have come to be called), manufacturing the consent of the people becomes all the easier. Though the proposed case for bombing Syria failed in September, manufacturing consent for regime change in Syria is still a continuing process. It is easy for Americans to believe that “they need us” – while yet failing to see the complexities and nuances that exist in reality. We assume that generally Middle Eastern “backwardness” and infighting must be remedied by our superior vision and simple solutions. This mentality will continue so long as Americans are affirmed in their flawed vision of the Middle East and the problems that these countries face. In reality, Hamra Street is one of Beirut’s most fashionable, modern, urban streets lined with cafes, bookstores, banks, and bars. Walking along Hamra St., it would actually be difficult to find head-to-toe clad Islamic conservatives. Urban Lebanese women have a reputation of being among the most carefree and immodest in the Middle East. You can find similar scenes in today’s Damascus, and other urban centers of Syria. This is why the Der Spiegal photo at the top of this page is such a welcome change in coverage of the Syrian crisis – it humanizes a people and a city that in September we were preparing to bomb. The photo reveals people living lives not much different from those in the West – modern people desiring some semblance of stability and normalcy. They don’t want to see their country on fire in the midst of what is now an international proxy war. 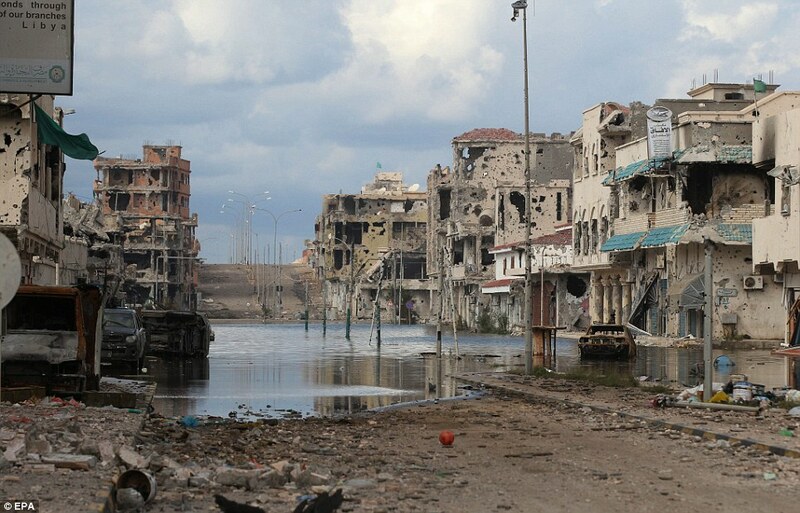 They don’t want their city to become the next Sirte. They don’t want to live under the Islamic extremists who’ve promised them Sharia law. They are complex, real people whose reasons for not siding with the rebellion may be much more nuanced than we are willing or able to recognize.